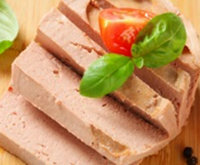 Home > News > Pate slicing… perfect for ultrasonics! Whilst cutting raw meat doesn’t readily lend itself to ultrasonic cutting, the opposite is true for pate cutting. Due to its soft, delicate and typically sticky composition, conventional blades produce poor results – poor cut face and a lot of blade residue will not please your sales and marketing people, or your maintenance team! And with basic automation systems offered by some suppliers, portion weights are poorly controlled, which will affect your giveaway and log or block yields, and your profitability – not good for business! So, what are some of the issues you need to consider when cutting your pate or terrine products? Well, firstly, most of these products cut best cold or chilled. The stickiness of warm pate exacerbates the issue of blade residue, so a firmer product produces best results. Next, processing your blocks or logs. You should consider whether you need to start and end trim your product, and take into account the yield loss this produces. Cutting logs individually will give you the best results, as waste trim can be minimised, but at the expense of output rates. Alternatively, your product can be loaded continuously, end to end, giving high levels of output. What about portion control? Technologically advanced machinery like Newtech’s autoSONIC machine range, offer a high level of portion thickness adjustment, with the possibility of pre-weighing, scanning, and post-cut weight feedback from an in-line checkweigher. Additionally, logs or blocks can be cut in multiple lanes to maximise output. Lastly, work out how you’ll pack your portions. Our autoSONIC machinery will automatically separate cut portions and there is the option for automatically picking and placing using robotics, offering you labour savings, reduced handling and higher accuracy. Your pate slicing process could benefit from a combination of ultrasonic cutting technology and advanced, proven automation – and the first step is to get some test cutting done. So get in touch today and we can arrange a trial.